Oscar winner Regina King came to succeed in a dreamy white dress. The Best Supporting Actress of “If Beale Street Could Talk” wore a sensational Oscar de la Renta gown with a dramatic slit. While many celebrities played 2019 safe with fitted gowns, Michelle Yeoh took her moment to epitomize regal elegance. The “Crazy Rich Asians” actress wore an off-the-shoulder evening gown by Elie Saab. The stunning ballgown was embellished with gold Lurex embroidery and iridescent sequins. “Black Panther” star Michael B. Jordan rocked the red carpet in Tom Ford. 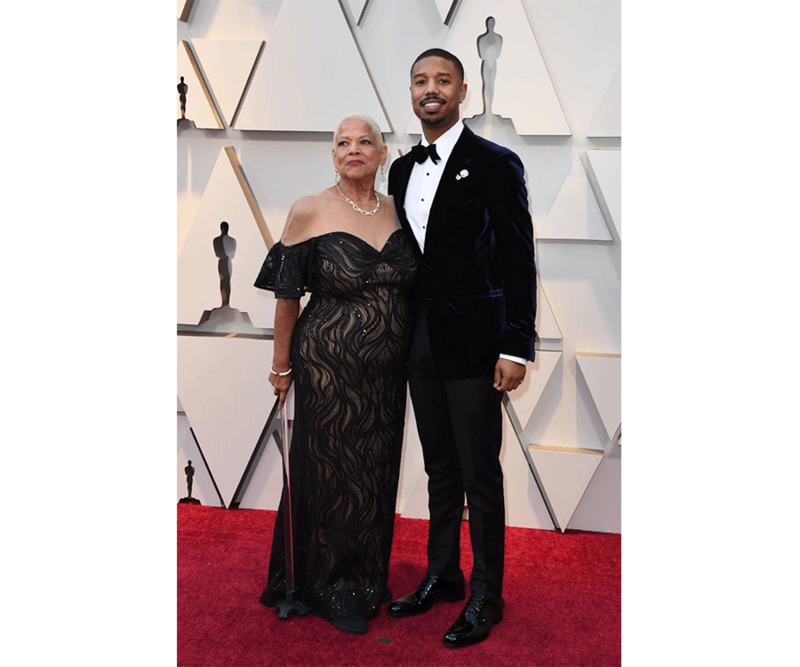 His best accessory was his mom, who joined Jordan on his arm at the Academy Awards! Sustainable and stunning! Laura Harrier, a shining star in Spike Lee’s “Blackkklansman,” turned heads with her socially-conscious Louis Vuitton dress. Harrier took on Suzy Amis Cameron’s Red Carpet Green Initiative and worked with Louis Vuitton to craft an eco-friendly gown that met Oeko-Tex environment design standards. 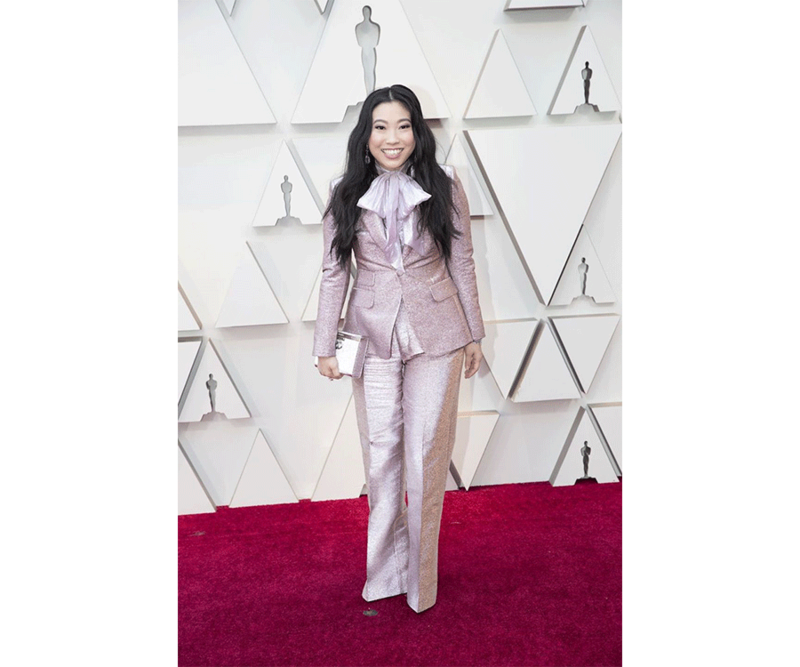 Awkwafina, comedy’s rising star, wowed audiences in her role as Peik Lin in “Crazy Rich Asians.” Her charm and wild fashion statements continued off screen, especially with the help of this jaw-dropping DSquared2 metallic suit. Rami Malek took home the Oscar for Best Actor last night, dressed to the nines in his sophisticated Saint Laurent tuxedo. He might have played the frontrunner of Queen, but he looked like an absolute King at the Academy Awards. Kiki Layne looked pretty in pink in a sweeping Atelier Versace gown. The star stood out among the crowd with her dramatic asymmetrical top. Who’s ready to bend the knee to Emilia Clarke in this outstanding Balmain dress? When the Game of Thrones star isn’t playing a queen, she still looks like royalty. The metallic dusty lilac gown was one of the most elegant looks of the night. The “Crazy Rich Asians” stars did not come to play at this year’s Academy Awards! Constance Wu, who originated the role of Rachel Chu in our favorite 2018 rom-com, won us over with her yellow tulle Versace gown. The actress looked like she stepped out of the silver screen and into a storybook. “Aquaman” star Jason Momoa embraced his soft side in a blush-toned velvet Fendi suit designed by the late Karl Lagerfeld who passed last week. The star and wife, Lisa Bonet, had the honor of wearing matching outfits from Lagerfeld’s last couture collection. And, yes, Momoa is wearing a matching scrunchie around his wrist—just embrace it. Inspired by their style? You can channel your inner Momoa and Bonet when you visit the Fendi at Aventura Mall. Pink was the night’s biggest color trend, and no one wore it better than Gemma Chan. The “Crazy Rich Asians” actress turned heads in hot pink Valentino gown and distressed-yet-demure messy bun. 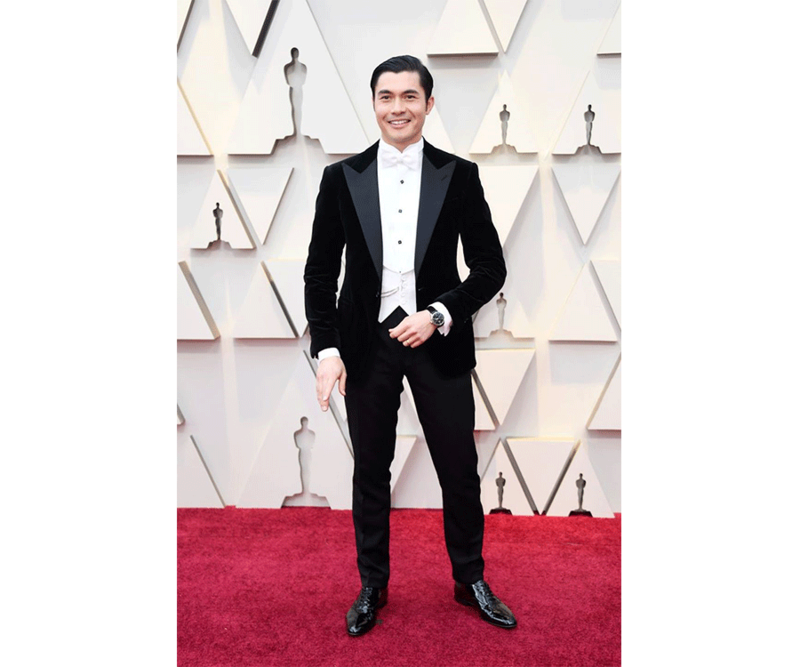 Hollywood’s new “it” boy, Henry Golding, showed up looking as dapper as ever in a sophisticated Ralph Lauren purple label tuxedo.